I’ve spent the past two weeks with my aging parents, helping them navigate the here and now while trying to survive myself in a region of the country where there is little to eat for someone who is vegan and requires all food to be gluten-free. My world was reduced to a rotation of bananas, grapefruit, apples, pears, nuts, rice crackers, and a very expensive jar of cashew butter. Anything more required a 50-mile round-trip to a larger population center—a journey I did not have time for. 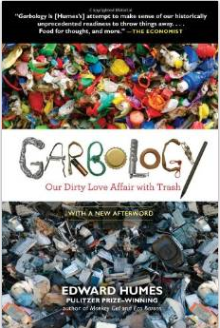 The trip was book-ended—pun intended—by a pair of days contorted by airports and planes, during which I read a fantastic book about garbage—yes, garbage. The book is called, fittingly Garbology by Edward Humes. It does for garbage what films like Food, Inc. did to heighten our awareness about what we take in to bodies. Garbology is all about what we throw away—tons and tons and tons of it (guacamole stays green in landfills even after 25 years! )—that is coming back to haunt us in ways no evil genius could ever have imagined. And our oceans? Full of little tiny plastic bits being gobbled up by plankton that eventually finds its way to our bellies. Our oceans are no longer saltwater. They are plasticized soup. And do we know what that does to us or the ocean or the plankton or the fish humans consume? Of course not. Or what it means for our future and the future of our planet? Do yourself a favor and go to a bookstore and order a copy NOW. Read it, pass it on, and start a one-quart-Mason-jar campaign in your house. And yes, you’ll have to read the book to find out what that means. Big hint: I will no longer be buying anything in plastic that cannot be purchased in another way. I will never again accept a plastic bag at a checkout line, and once our current supply of Ziplocs and plastic wrap is gone, not one of my hard-earned teaching or writing dollars will ever be spent on them again. The book’s message? Reduce, reuse, recycle, and refuse to buy anything that can’t be reduced, reused, or recycled. Just like we used to be an entire century ago. Finally back in my own home, my computer (so much plastic! and mountains being chewed up for the rare earth elements computers require!) now in my hands instead of the repairman’s, I feel like a bit of a stranger in my house. I’ve always contended that it takes a few days for the soul to catch up once we’ve been aloft, and the older I get, the longer it takes. This weekend I binged quite thankfully on fresh vegetables from our farmer’s market, grilled tempeh, the last of the gluten-free/vegan sandwich bread from Bridge Baking Company across the river in Lewiston, and let myself have my first cup of coffee in weeks. Black. Anyone who has been following me knows about my struggles to give up cream in my coffee. I finally broke the beast by going cold turkey. Forced to stay in a motel this time, because my parents finally filled up enough rooms of their house that there was no place for a guest to cast a weary body, I developed quite a morning and evening tea ritual to help me remain calm in the midst of mind-bending storm of problems. The world is not a friendly place for aging Americans, and our culture has almost no provisions for assisting elderly folks that do not require sizeable amounts of money. Medicare is awful. You should not be facing bankruptcy at the age of 80 because of medical bills. You should not have to sell your house or divorce your spouse just because you need long-term care. I believe it when my father says, “The United States just wants a place to throw away elderly people.” It’s the truth. They’ve faced ordeal after ordeal, and I’ve seen it proven over and over: in our culture, being old puts you at the same status as . . . garbage. My next adventure is to start making my own chai. The recipes seem simple: some black leaf tea, a few black pepper corns, a cinnamon stick, some fresh ginger root, a cardamom pod or two. You can buy a special little mesh cage for sitting down into your teapot designed to contain all those bits and pieces. For the price of a few days of coffee shop visits, I can have a little chai assembly and start my own ritual. And I gave my liver a bit of nourishing, too, since I thought a diet of nuts must have been particularly hard on it—morning cups of dandelion tea. With the first sip I could feel that organ’s gratitude. Has me completely rethinking what we’ll do with our yards plentiful crop of dandelions next spring. My parents? After hauling off a mountain of garbage—most of it plastic water bottles and food packaging—another catastrophe was avoided. Such has been my job this past decade—flying 2000 miles to thwart catastrophe. I tell them they both have 9 lives. My parents both tease me about my longstanding interest in conservationism. They remind me about having been a member of the Conservation Club in junior high and how we went around picking up garbage. It was only as we started driving away from the waste transfer site that I recognized the irony—all that plastic trash in all those 33-gallon plastic bags that the waste transfer site required. One more thing to look into: what on earth (literally) do we use in place of those?